The 436th Session of the Maryland General Assembly began on Wednesday, January 13 and ended Sine Die, April 11 at midnight. The members of the Harford County Delegation suffered a great loss on February 10 of this year’s session with the brutal slaying of Deputy Sheriffs Pat Dailey and Mark Logsdon. It was a great loss for our county and the State of Maryland. The Harford County Delegation submitted legislation, HB 1581- Harford County Deputy Sheriffs Dailey and Logsdon Benefits Memorial Act which passed both houses and was signed by the Governor on April 4. This emergency bill raises the maximum age, from 18 to 26, of a surviving child to whom a line-of-duty death benefit can be paid under the Law Enforcement Officers’ Pension System (LEOPS). The Governor signed the bill on April 4! With the Harford County Delegation, I sponsored, HB 1624-Transportation – Highways – Heroes Highway, which dedicates the portion of Maryland Route 924 (Emmorton Road) between its intersections with Maryland Route 24 and Singer Road as Heroes Highway. I was very proud to have obtained all 141 Delegates’ signatures on the House bill while Senator Norman obtained all 47 Senators’ signatures. The bill is on the Governor’s desk for his signature. I introduced HB 390-Maryland Income Tax Refunds – Warrant Intercept Program – Statewide. The law will create a Statewide Warrant Intercept Program that would allow the Comptroller to withhold State tax refund money until an outstanding warrant is properly satisfied. This bill authorizes all counties to participate in the warrant intercept program if the Sheriff of the county notifies the Comptroller that the county intends to participate in the program. A statewide program would allow for uniformity across the State for all individuals that have outstanding warrants and serve as a tool to help ensure safety for our law enforcement officers and the public throughout the State. The Comptroller’s office would be able to withhold tax refunds from individuals who have outstanding arrest warrants and is designed to provide criminal suspects with a financial incentive to turn themselves in safely. Upon clearing the warrant, the tax refund is immediately released, giving individuals access to their refund, while also keeping law enforcement officials and the public out of harm’s way. The cross-file bill, SB 425, is awaiting the Governor’s signature. in Harford County….this repeal was a money and timesaver for both the owners and the Clerks’ Office which had to collect the fee and forward it to the Comptroller. The bill was signed April 12. I also cosponsored HB 459-Birth and Death Certificates-Fee Reduction which reduces the fees for these vital records to $10. The Governor is reducing as many fees as he can as fast as he can! For the second time in two years, the budget passed without new taxes. The Fiscal 2017 Budget funds all of Maryland’s priorities while still maintaining a surplus of $415 million. The Fiscal 2017 budget is an investment in future generations in Maryland. The Budget includes a $6.3 billion investment in Maryland’s public education: the largest investment ever in Maryland’s history! K-12 per pupil funding will increase in every jurisdiction in the State. Governor Hogan is the first governor to fully fund the GCEI in his second year! Aid to community colleges will also increase in fiscal 2017 by over $18 million through the Cade Program and aid to local libraries will increase to $74 million. Almost $5 million in additional funding has been provided to implement the recommendations of the Opiod and Heroin addiction Task Force to enhance quality of care, expand access to treatment and support services and strengthen law enforcement options. The Budget also provides $ 348 million toward existing substance abuse programs and substance use disorders. This Budget takes important steps toward creating an environment where businesses can grow and flourish. An historic record investment of almost $14 million is in the Budget to provide financing opportunities through the Small, Minority and Women-Owned Investment Account. At the same time, the Budget includes over $50 million toward workforce development programs providing job seekers the opportunity to meet the demands of the 21st century employers. This includes occupational skills, entrepreneurial training and job search assistance. HB 1013 – Maryland Open Transportation Investment Decision Act of 2016 completely changes the way Maryland funds its transportation projects. It will create a scoring system that will favor transit projects in urban areas. The legislation severely limits the decision making of local governments and creates new mechanisms to divert taxpayer dollars away from highway infrastructure and puts at risk major road, bridge and transit investments in every Maryland county. These bills are set to become law. I voted to sustain the Governor’s vetoes. HB 312-Public Safety – Renewal of Handgun Permits – Fingerprinting states that when renewing a handgun permit, a person does not need to be fingerprinted unless the Secretary of State Police requires fingerprinting to resolve discrepancies surrounding a person’s identity. This legislation is seen as a win for supporters of the Second Amendment. This legislation will take effect on October 1st, 2016. HB 898-Property Tax credit-Elderly Individuals and Veterans which authorizes local governments to grant, by law, a property tax credit for a dwelling of (1) an individual who is at least 65 years old and has lived in the same dwelling for at least the preceding 40 years or (2) a retired member of the U.S. Armed Forces who is at least 65 years old. The amount of the property tax credit may not exceed 20% of the county or municipal property tax imposed on the property and may be granted for up to five years. The bill takes effect June 1, 2016, and applies to taxable years beginning after June 30, 2016. It has been a pleasure to hear from you during the 2016 Session and I have listened to your concerns and opinions before voting. We may not always agree, but I have tried to do what is best for the citizens of Cecil and Harford Counties and the State of Maryland. I enjoyed working with Hogan Administration to bring to fruition some of the promises that the Governor made to the people of Maryland. We hope to fulfill more of those promises to small businesses and those people who live in Maryland. MARYLAND IS HEADED IN THE RIGHT DIRECTION! 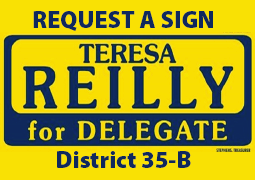 If you have any questions or concerns during the Interim, please do not hesitate to contact me at Teresa.reilly@house.state.md.us or at 410-841-3278. The Annapolis Office will be open on Tuesdays and Wednesdays from 9-4 if you wish to pay a visit. Sign up to get weekly e-newsletters about what's going on in Annapolis from Teresa during the legislative session.